Michael Chiklis — known for playing police officers on hit shows like 'The Commish' and 'The Shield' — discusses gun control in America, noting that public discourse on the topic needs to be more "nuanced" than it currently is. Bryan Cranston on gun control: How much death is enough? Larry King: You sing about a deranged man who is thinking about going on a killing spree. Larry King: Is this an anti-gun song? Michael Chiklis: See that, this is what bothers me about where we are politically in the world right now. It’s either or. Larry King: Why can’s someone be anti-gun? Michael Chiklis: I would love to see… No, but that’s fine. But I’m just saying nuance has to be brought into the political arena again. And I am not anti-gun, I am just anti being stupid with regard to guns. You need to have great legislation, you know, you have to prevent, you know, the wrong people from getting guns. So I think that there’s a middle ground between those two things. I grew up in a hunting tradition, my father was a hunter. I’m just anti getting guns in the wrong hands, so let’s be smart about this. Larry King: Is it too easy to get a gun? 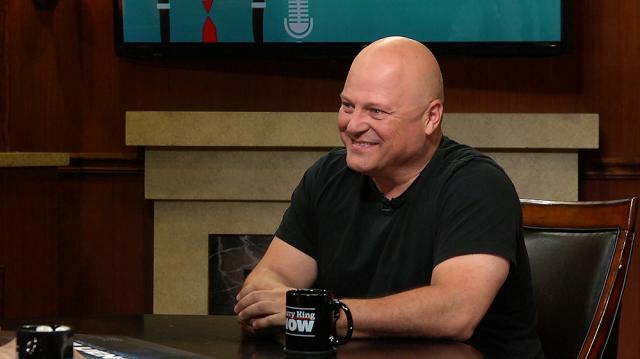 Michael Chiklis: It’s just too easy to get a gun. I’m sorry, you know, it should be as hard at least to get a gun as it is to get a driver’s license. So it’s just, you know, it’s just common sense.